It’s the holiday season again, and while Christmas is the holiday I celebrate this time of year, I’m pretty sure that whatever holiday you celebrate, we have something in common—we all tend to walk down memory lane, remembering all the holidays that have come before. So often we are pulled back to our childhoods, when the world was a more innocent place and we had none of the responsibilities that adulthood brings. Christmas is bittersweet for me at times. So many of the people I love and used to share the holiday with are gone. Some have passed away. Others have only moved away. The world moves on and we must move with it, but that doesn’t stop us from remembering. We all have our traditions. I grew up taking one holiday at a time, When fall started to nip the air, we’d have the fun of dressing up for Halloween and when that was over we’d be looking forward to Thanksgiving and turkey—back then the only time we ever had turkey was at Thanksgiving, so it was a real treat. We didn’t even think about Christmas until we saw the Macy’s Thanksgiving Day parade, when we’d hear the marching bands playing Christmas songs. Santa Claus would show up at the end and then we’d start counting the days and making our lists. I remember all the little things. The Advent calendars with chocolate in them. The Advent wreath and poinsettias at church. Walking, walking, walking, up and down city streets till my mother found the perfect tree, and then all of us, my mother, my father, my sister and me, carrying it home to our apartment. I remember the excitement of waking up Christmas morning and seeing that Santa had decorated our tree when he came to leave the gifts—and oh, the gifts. Unlike today, the only time we got toys was on our birthday and Christmas,and it seemed like Santa always managed to know what we wanted the most. 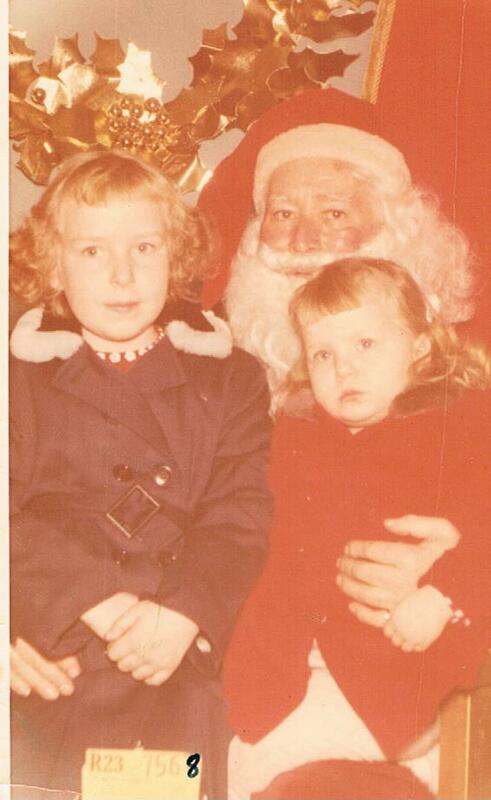 I remember Christmas stockings stuffed with oranges and gold foil wrapped chocolate coins. I remember candy canes and ribbon candy. I remember my mother cooking wonderful dinners and my grandparents, aunts, uncles, and cousins all coming over to share the joy. And I remember the music. My mother used to put Christmas albums on the“hi-fi” and we’d sing along. There were a lot more religious carols on all the albums then; and even the ones with a lot of the secular Christmas songs seemed to appeal more to the grownups. My grandmother in Germany had sent over some that were all in German (naturally), and while the music was pretty, it seemed very somber to me as a child. But there was one album that I loved and would beg my mother to play it over and over. 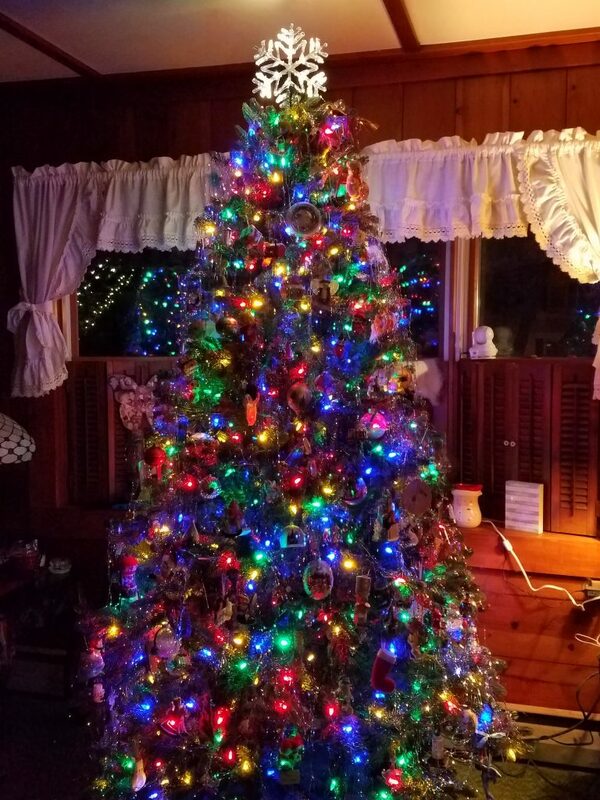 I can still see the jacket, with its 50s style family in their pajamas, the children sitting on the floor in front of the fireplace, the tall Christmas tree with the train running around the bottom, the parents smiling as they took in the scene. The album was called “Christmas Holiday” and it was almost entirely the kind of songs kids love best, like Frosty the Snowman, Rudolph the Red-nosed Reindeer, and The Night Before Christmas. No famous names, just a bunch of studio singers, and I could listen to it forever. As I said earlier, the world moves on. Over the years, people stopped listening to record albums because technology improved sound quality; tapes, then CDs, and now digital have become the norm. But Christmas and its memories aren’t about sound quality, they are about feelings,and I lamented not being able to listen to my favorite album anymore. Then one year my husband managed to copy the “Christmas Holiday”onto a cassette tape for me. I was ecstatic. I listened to it in the car and shared it with my children. They didn’t have the same reaction to it that I’d always had (I admit it’s dated, but so am I.) but they knew it made me happy to hear it so they didn’t mind. When CDs became the big thing, my husband copied the tape onto a CD, and I’m listening to it even as I type this. It feels like Christmas to me. I doubt that the people who made that record so many years ago ever thought they’d be leaving that kind of legacy. They probably never considered the lasting effect they made just by singing a few songs that everyone sings all the time; mostly likely they were just happy to get paid for singing. It’s a little like George Bailey in “It’s a Wonderful Life”–you just don’t realize how much of a difference you make just by being you. Think of that this Christmas—and all through the year. Remember each of us makes a difference and the smallest actions can have lasting effects, so try to make them good ones. May your holidays be bright with happy memories even as you create new ones. I’ve taken the liberty of using my digital recorder to make a copy of one of my favorite songs from the “Christmas Holiday” CD. It’s probably not a song you’re familiar with—I know I’ve never heard it anywhere else—but I think you’ll see why it’s a favorite of mine. So have a listen to “When Christmas Comes to Our House”. Sweet. You’re right — I’ve never heard that song before. That’s probably one of the reasons I still like it so much. It’s different. I remember the kind of albums you reference with just some everyday singers. Can’t say I ever heard this song, but it’s fun. But I can recall and visualize the old Christmas albums in my home as well. 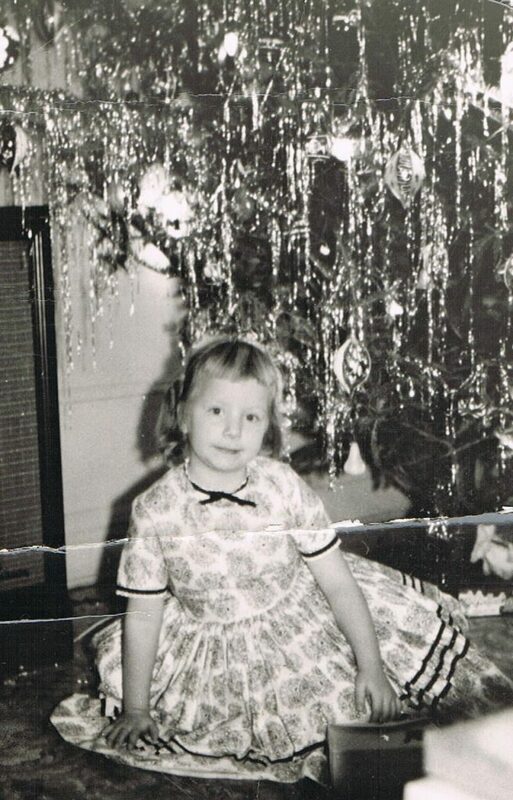 My Mom loved Christmas and played them over and over, with the crackling sound, scratches and skips. My Mom’s favorite song was The Little Drummer Boy – always brings a tear to my eye thinking of her (even when she was alive). My Dad enjoyed Christmas only because he enjoyed the excitement and happiness that it brought children, and of course to my Mom and I. But I think if he was by himself and living alone, he probably would never have bothered with the whole big Christmas thing (I could be wrong – again, he died so long ago and I was too young to ever truly get his feelings on Christmas), but I just can’t picture him putting up a tree, buying gifts, writing cards or decorating. I love the vision of Christmas long ago and enjoy the stories of an old fashioned Christmas. I have the Dickens Lighted Villages and I love to picture what it was like walking down those streets, shopping at the markets, and carolers singing. When I was very young, carolers still rang our bell and sang songs. Many memories you reference I can also relate to, like the advent calendar and the church so beautifully decorated. We never missed church. 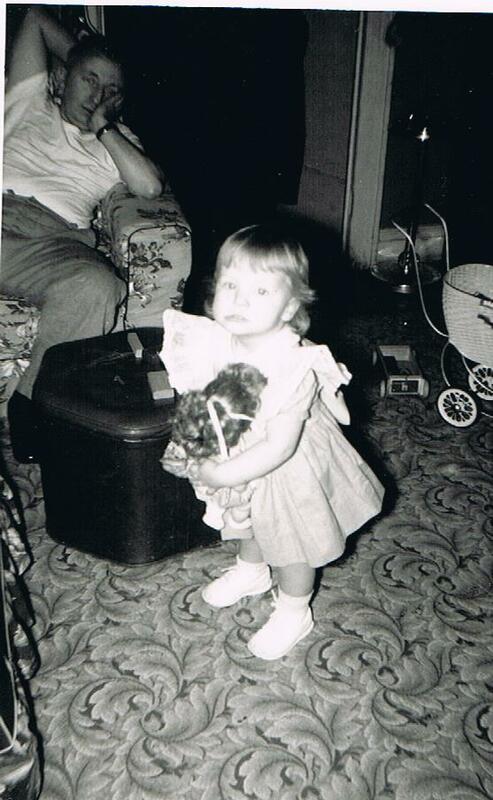 Like your family, toys were received for special occasions such as Christmas. My Mom did a lot of baking. The house always smelled so good. The house was lively and family, friends and neighbors would drop by. I couldn’t wait for Rudolph and Frosty to be on TV. It was special then. I still love Christmas, but it certainly is very different today. Thank you for sharing your memories. Merry Christmas! Thank you for sharing your memories too. It’s nice when people can relate like that. I’m sure Christmas memories from today will be very, very different, since the world we live in seems so heavily tipped in favor of buy, buy, buy, instead of give, give, give. I was just saying to my sister that having these wonderful memories is a double-edged sword: wonderful to have them and yet so sad at how it’s all changed now. Merry Christmas to you! May it be bring lots of new happy memories to add to the collection. Totally agree that the world has changed and the spirit of giving is somewhat lost, but we have to believe that there is still more good than bad. As you state, each of us makes a difference with lasting effects. I really believe that to be true, which is why I feel so good about LI cares, and hosting the toy and food drives at work. Every bit helps and everyone donates and participates in what is best for them. There are so many great causes, whether it’s helping a friend or stranger, and so many noteworthy charities. It starts with enjoying what we have and simply being kind. Here’s to a wonderful 2019 !! Keep on writing !